Hero MotoSports Team Rally's Joaquim Rodrigues got off to a flying start at the 2017 Afriquia Merzouga Rally, finishing Stage 1 in fifth position with a time of 31m45s. His Indian teammate, CS Santosh, who was back on the saddle after a two-month rest owing to an injury, finished the stage in 16th overall with 35m26s on the clock. Team Yamaha's Xavier De Soultrait leads the Rally with a time 27m36s, while Franco Caimi, who is two minutes behind him is second and Alessandro Botturi is third. Leg 1 measured a total of 84km, out of which 41km were competitive. There was also a 2km Prologue stage which Rodrigues won, which allowed him to lead the field going into the first stage. Riders had to deal with rising ambient temperatures of the Moroccan desert, the challenging sand sections and the tricky navigational challanges through the loop of Erfoud. Rodrigues said that starting first meant he opened the tracks for the riders behind him, which meant he was losing time. 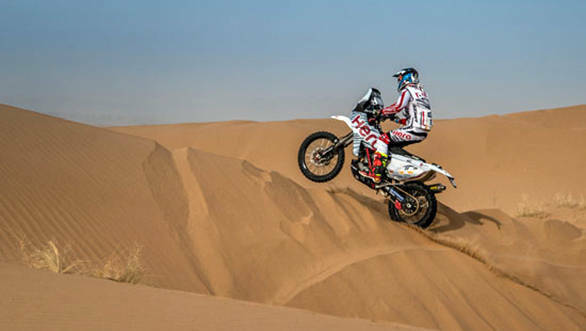 However, he seemed content with the results and said that he was looking forward to Stage 2 where the riders will encounter even more sand and dunes. CS Santosh was also happy with his result, especially because he managed to recover from his fall in the Prologue stage, which dropped him to 17th. He managed to recover and is hoping to improve in the next stages. He also said that the feeling with the bike is really good and he is much better prepared than last year. Leg 2, which is underway right now, has 188km of competitive sections and 53km of transport. The stages will be challenging, especially the Erg Chebbi region which has several sand dunes and river beds.